Grace Digital GDI-BTPB300 3-Play jukebox is a smart apt-X bluetooth 4.0 audio receiver. The most excited feature it has is the Multiple Bluetooth Connection. This 3-Play Jukebox allows up to 3 Bluetooth source devices to connect with him at the same time. This is not simply pairing mode. This solid connection permits you to play from either of these 3 source devices as you wish and almost without any latency when switching. Many music lovers have more than one Bluetooth source device. The normal situation when you want to change between then will be like that: you have to un-pair one Bluetooth device such as iPhone from your Bluetooth receiver to free the link channel for the next one, Then pair and connect that to your Bluetooth receiver before perform any playing instructions. This smart device has just changed all this. Grace Digital GDI-BTPB300 3-Play Jukebox Bluetooth Adapter eliminates the annoying pair&un-pair steps. Set up is extremely fast and easy. Double push of the only multifunction button on the center will convert the bluetooth receiver into a connectable mode. Once a Bluetooth connection between a particular source and the receiver is done, one of three LED indicators on the front will be glowing blue to show that is established. Then you can connect other 2 bluetooth devices in the same procedure. After that simply pressing the play button on the source device will give you a flawless switching between these 3 devices. It only weighs about 1.4 oz and less than a standard card in size. It’s very portable and with great battery life. The internal 600Mah battery and Bluetooth 4.0 energy saving tech entitle it up to 10 hour operation time. It uses dual (automatically switching) 3.5mm/Optical technology to suit any stereo systems you want it to work with. Unlike others, Grace Digital GDI-BTPB300 3-Play Jukebox Bluetooth Adapter is a smart Bluetooth audio receiver. These unique features mentioned above make 3-Play Jukebox Bluetooth Adapter great for parties, jam sessions, picnics, camping. 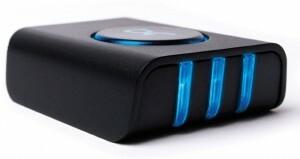 GDI-BTPB300 3-Play Jukebox: Smart Bluetooth Receiver <Loved it! Does Grace Digital GDI-BTPB300 3-Play Jukebox Bluetooth Adapter work off AC 110 to 220 Volts? As I plan to carry this around when I travel, this is a requirement. This Grace Digital Bluetooth multi-connection receiver gets power from a micro USB slot not an AC adapter so you can carry it everywhere you want without worrying about the volt supply issue.